Please note all components for both PAL and NTSC versions of TOLB have arrived and all pre-orders will begin shipping this morning. TOLB for both PAL and NTSC C64 and C128 computers are now available on a continuous basis! TOLB has been tested to consume only 9mA of power. That's only 1/3rd the power of a standard green LED!! Buy one or more TOLB and get a 10% discount on up to 5 PLAnkton modules - you also save on shipping when you combine orders. I have several C128s; should I consider changing the 8701s to TOLBs? How do I know if they are a problem? I have on a few occasions tweaked the trim capacitor with a frequency counter using pin 8 of the 8701 to get as close as possible to 14.31818 MHz, but other than that, I had never thought very much about the 8701 until I read this topic. Would a TOLB help a finicky RAMLink cartridge? Most people who buy TOLB use it to convert C64 and C128 between PAL and NTSC but it obviously can make a good substitute for the 7701/8701 if yours has failed or you want to do away with the need to adjust the trim capacitor. TOLB has a built-in SMT oscillator and is therefore always providing the very exact frequency required. No, TOLB will not change anything about a problematic RAMLink. PLAnkton, GandALF and TOLB are now distributed in Europe by Poly Play. TOLB NTSC Color clock and dot clock outputs. The small error in frequency output is caused by the oscilloscope aliasing. Exact frequencies are 14.31818MHz for color clock and 8.18182MHz for dot clock respectively. TOLB PAL Color clock and dot clock outputs. 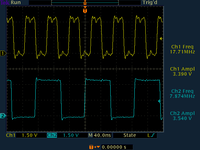 The small error in frequency output is caused by the oscilloscope aliasing. Exact frequencies are 17.7344MHz for color clock and 7.882MHz for dot clock respectively.